The Australian Competition and Consumer Commission has settled, by consent, its proceedings against Australian Biologics Testing Services Pty Ltd and its director, Ms Janette Burke. The ACCC had instituted proceedings in the Federal Court, Sydney, alleging that representations made in brochures and on Australian Biologics' website in 2001 and part of 2002 were false, misleading, and deceptive. The ACCC alleged that the representations were not supported by scientific (or medical) testing. Australian Biologics provides medical services including Thermography, Live Blood Analysis and the Bolans Clot Retraction Test. It promoted these services in printed brochures and on the Internet. Australian Biologics and Ms Burke have undertaken to the court not to make 29 specific claims as to the efficacy of the services. The court also ordered that Australian Biologics forward a notice to all practitioners who referred patients to Australian Biologics and to all patients who used the services of Australian Biologics between 1 July 2001 and 2 July 2004. Australian Biologics and Ms Burke have agreed that these tests are not diagnostic tests and the results of such tests are not indicative of a specific medical condition. "Where claims are made about the efficacy of medical testing services they should have a supportable scientific basis", ACCC Chairman, Mr Graeme Samuel, warned today. "The ACCC is of the view that such scientific support should be of a high standard such as articles published in peer reviewed magazines. "This is even more important in relation to medical claims which can have a serious impact on a person's wellbeing. "In this case the ACCC considered it important that any misleading impression about the services in the minds of patients should be corrected". The ACCC alleged that Australian Biologics breached section 52 of the Trade Practices Act 1974, which prohibits corporations from engaging in misleading or deceptive conduct; section 53(c), which prohibits corporations from representing that goods or services have sponsorship, approval, performance characteristics, accessories, uses or benefits they do not have; and section 55A, which prohibits corporations from engaging in conduct likely to mislead the public about the nature, characteristics, suitability or quantity of services. There may be insufficient scientific and medical evidence to support all of these claims about our services. These tests are not diagnostic tests and the results of such tests are not indicative of a specific medical condition. Note the "may be insufficient". No maybe about it, there is NO evidence to support the claims. So, what will happen next? Will Australian Biologics stop testing people and then saying that their tests show that some alternative remedy is needed? Well, of course not! Live Blood Analysis and the other scams practised at Australian Biologics won't be used to diagnose "a specific medical condition", they will be used to diagnose general medical conditions like "weakened immune system", or "presence of toxins", or "chemical sensitivity", and it will be business as usual for Jennie Burke and the quacks she feeds victims to. Business may even be better, because people will have to keep coming back to see if their vague ailments are getting any better. And after a short time, when new names have been found for Thermography, Live Blood Analysis and Clot Retraction Testing, I would expect Australian Biologics (perhaps with a new company name and structure) to be doing what it has always done, and they will point to the advertisement and innocently state that they never said they were not going to be offering Differential Thermal Imaging, Erythrocytic Tomography and Hypothrombology. I made mention recently of an Australian quackery testing laboratory which had fallen foul of the authorities. The owner of the place took offence at what I said and called in the lawyers, and because of Australia's draconian defamation laws I had to take the threat seriously. The letter from the lawyer, with my responses interspersed, appears below. And, yes, I did have my reply checked by a barrister before I hit the "Send" button. We are solicitors acting for Australian Biologics Testing Services Pty Ltd and Jennie Burke. I have changed the headline on the article. I did this immediately upon receiving your email as an indication of my good faith in this matter. and is defamatory of both Australian Biologics and Ms Burke in numerous respects. I quoted verbatim from the media release issued by the ACCC, which can be seen at https://www.accc.gov.au/content/index.phtml/itemId/524259/fromItemId/2332 and I provided a link to that document on the ACCC web site. I have no access to the settlement documents, so I had to rely on the content of the media release; if the wording of that media release somehow misrepresents the settlement then that is a matter you should take up with the ACCC. If you could provide me with a copy of the settlement documents I would be able to see for myself where I was mistaken, and I would then, of course, immediately change my article to remove any misrepresentation. It would help if you could highlight those parts of the settlement which you believe I have misrepresented. Please elaborate on the alleged defamatory statements. It is difficult to respond adequately without knowing what to respond to. We are instructed to advise that unless the article is corrected (to be factually correct) or withdrawn forthwith we hold instructions to take any necessary action to protect our clients' reputation. This would include applying to the Supreme Court for an injunction and/or commencing proceedings for defamation against you without further notice. Please advise me of the places where the article is factually incorrect. If you are referring to my opinions about the worth of the medical procedures offered by Australian Biologics, then I must say that I have seen no evidence of any scientific validity of these procedures published in peer-reviewed literature. A search of the Medline database (available at https://www.ncbi.nlm.nih.gov/entrez/query.fcgi) for the phrase "live blood analysis" results in a message saying "Quoted phrase not found". This could be because the research has been published too recently to have been indexed on the date when I conducted the search (August 12, 2004), although this seems unlikely as the ACCC action against Australian Biologics and Ms Burke commenced some time ago and Medline is generally quite up to date for published papers. Another possibility is that the research has been published in journals which are not indexed by Medline. A search for Bolen's Clot Retraction Test produced two citations, one from 1968 written in Italian and one from 1973 written in Russian. I do not know whether either of the respective journal issues would be available in Australia, and I wonder if there is some more recent research into this technique. The comments above about inclusion in the Medline index apply here as well. Medline shows 5246 citations for "thermography" and it is obvious that I cannot read all of these to see whether they are applicable to the activities of Australian Biologics. In any case, according to the ACCC media release, Ms Burke has renounced the use of thermography as it was being used by Australian Biologics. I am prepared to change my opinion about the worth of these procedures if I am presented with evidence. Please provide me with journal citations, if available. I have access to the excellent medical library at Westmead Hospital, so I should have no trouble acquiring the articles and published papers. On a philosophical note, it would appear that Ms Burke and Australian Biologics have a serious dilemma. Medical procedures fall into two broad categories - diagnosis and treatment. As Ms Burke has apparently conceded that the procedures mentioned above have no diagnostic value (although the actual terms of the settlement, which I have not seen, may not really say this) and she is not, as far as I know, claiming that they cure or treat anything, one must ask what benefit accrues to any client of Australian Biologics who pays for these services. I am sure that you can advise Ms Burke of the legal term for offering a service with no benefit in exchange for money. Should our client be forced to commence legal action we will also be seeking orders that you pay our clients' legal costs. As is my normal policy, your email and my response will be published on the Millenium Project web site at the next regular update. The legal attack made last week on my freedom of speech has continued. Briefly, the story is that someone said that they can do something, I said that it was unlikely, they said that they had strong evidence, I said "Show it to me", and they threatened to sue me. How clearly can I say this? "Show me the evidence and I will go away". Here is the latest correspondence between the lawyers and me. We refer to your email response of 12 August. It is noted that apart from changing the heading to the article you have not altered your website article with the result in our clients' view that the defamation is continuing. Please provide us with an address for service of court documents on you. In my subsequent email of August 13, I offered to make any changes to errors of fact in the article. As you may not have received this later message, I have included a copy below. I believe that this matter could be settled amicably if I could see the settlement documents and the scientific evidence for the efficacy and validity of the procedures carried out by Australian Biologics. I intend to apply for access to this data by making a Freedom of Information request to the ACCC, but this should not really be necessary. If the settlement documents exonerate Australian Biologics then I can see no reason why they should not be proudly made public. To resolve a possible contravention of the Act, the ACCC may decide to accept formal administrative settlements or undertakings from businesses, including in addition to or in lieu of taking legal proceedings. It usually does so pursuant to its power under the Act to accept court-enforceable undertakings. The ACCC may enforce such undertakings in court if they are not honoured. (Note: In early 2013 the ACCC remodelled its entire web site. A new enforcement policy was issued in 2012 (you can read it here). The words quoted above come from the policy in effect in August, 2004. In that release it also states that "[t]he scientific evidence filed by Australian Biologics in support of its tests was extensive, impressive and compelling". Surely research of this nature should be made available to the medical community, and I look forward to receiving the relevant citations from peer-reviewed journals, or perhaps even copies of the papers themselves. As I said above, this matter could be settled by making the terms of the settlement available. If they are so supportive of Australian Biologics' position, I can see no reason why the settlement documents could not be made available on the Australian Biologics web site, along with the supporting research. I reiterate my willingness to correct any defamatory statements or statements of fact in my article, but I cannot correct anything if I do not know what is wrong. If Ms Burke cannot enumerate her specific complaints, then I am led to assume that her threats of legal action are simply a tactic to stifle my freedom to express an opinion. I should state here that Ms Burke is free to say, write or publish anything she likes about me and I guarantee that I will never take legal action against her for defamation. I realise that Australians have no constitutional guarantee of freedom of speech, which is why people are free to exploit the legal system to silence and impoverish critics. It is ironic, then, that Australia was not only a significant contributor to the drafting of the Universal Declaration of Human Rights (as one of the eight countries represented on the drafting committee), but an Australian was the President of the UN General Assembly at the time that it was adopted. According to the Department of Foreign Affairs and Trade we still support the Declaration, and I do not see where Article 19 is excluded from that support. Another week, another lawyer. It looks like Australian Biologics aren't using the expensive services of the Sydney law fraternity any more and have called in someone from out of town. It seems strange that a person and company who are both in Sydney should use a lawyer from another state to threaten someone in Sydney, especially as defamation laws are not exactly the same in both states. I am still waiting for someone to tell me what mistakes, misrepresentations and untruths I have committed. Surely someone can list them. If they exist, of course. I confirm that I am the solicitor acting for the company referred to above and have received instructions concerning a web site article placed by you on your ratbags.com.au site. The contents of the article are untrue, not based on any facts and are defamatory to my client. The purpose of this letter is to demand that you withdraw the article within 24 hours of receipt of this fax failing which I have instructions to institute appropriate proceedings. In the event that my client is forced to take any action against you an application will be made for an order for payment of costs by you. I received your fax today requesting that I remove certain material from my web site at www.ratbags.com (no ".au"). I have had previous correspondence with Mr Richard Farago of the law firm Langes about this matter, and I have twice asked to be given specific details of any errors of fact in what I wrote. I have received no answer, despite my unqualified offer to correct any error as soon as evidence of the error is provided to me. I make the same offer to you — tell me in which way "the contents of the article are untrue, not based on fact and are defamatory" and I will do my best to rectify matters. I will also repeat to you my promise not to take action for defamation against your client, whatever is said or published about me. As evidence of my good faith, I refer you to an article by Eve Hillary, titled "The Jennie Burke Story", which was published on more than one web site in late 2003. That article accused me of being malicious and underhand, and also suggested that I was an active and aware participant in one or more conspiracies. As you can see, my commitment to the principles of free speech extends to allowing people to make ludicrous and unsupportable statements accusing me of criminal activities. I do not know why Australian Biologics Testing Services Pty Ltd no longer appears to be using the legal services of Mr Farago and Langes, and has chosen to use a lawyer in Queensland rather than in New South Wales where the parties are located. I assume it is not to bypass Section 8A of the NSW Defamation Act 1974 (as amended by the Defamation Amendment Act 2002) (1), which limits the ability of corporations to sue for defamation in New South Wales. As is my normal policy, your fax and my response will be published on the Millenium Project web site at the next regular update. Note 1: The NSW Defamation Act 1974 was repealed by the NSW Defamation Act 2005. The prohibition on defamation suits by corporations still applies. A friend informed me that there was some sort of alternative medicine conference in Sydney during the last week and one of the speakers was a quack named Jennie Burke, who used to sell (and probably still does sell) scientifically unproven, worthless diagnostic tests. The entire content of her talk was apparently about how she had triumphed over the Australian Competition and Consumers Commission and the Australian Skeptics. Her victory over the ACCC can be seen in this media release, where it says "Australian Biologics and Ms Burke have agreed that these tests are not diagnostic tests and the results of such tests are not indicative of a specific medical condition". In the newspaper advertisements which Australian Biologics were required to run it said "There may be insufficient scientific and medical evidence to support all of these claims about our services. These tests are not diagnostic tests and the results of such tests are not indicative of a specific medical condition". Some victory. I assume that by Australian Skeptics Ms Burke meant Professor John Dwyer (who first alerted the ACCC to her quackery) and me. Professor Dwyer is not now and has never been a member of Australian Skeptics (although he is a good friend of the organisation) but facts have never been of much use to the sort of people who promote useless medical quackery. Ms Burke's victory over me consisted of employing two law firms to threaten me, both of whom retreated when I quite reasonably asked them to produce the apocryphal published scientific papers which supposedly validated Ms Burke's ludicrous claims. The story so far: In July 2004, a "pathology" testing laboratory named Australian Biologics avoided examination of its activities by the Federal Court of Australia by agreeing to stop doing worthless, unscientific "medical" tests. Part of the settlement with the Australian Competition and Consumers Commission was that the settlement terms should be made public and that no denial of any contravention of the Trade Practices Act should be made. Australian Biologics threatened legal action against me for discussing the settlement (but refused to supply me with a copy of the document) and issued a media release saying that there had been no breach of the law. The owner of Australian Biologics, a well-known promoter of quackery called Jennie Burke, later appeared at a quackery conference to announce her great victory over me, the ACCC and anyone else who dared to suggest that her non-scientific methods of extracting money from wallets were suspect. You can see the saga so far here. Now read on. 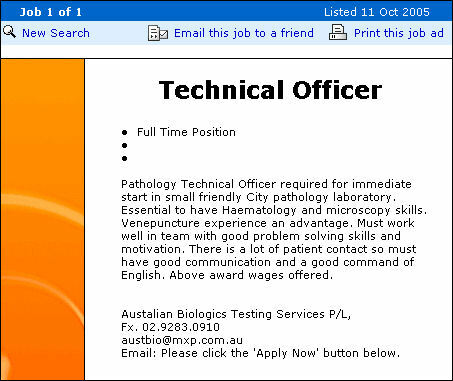 The following advertisement appeared on the employment site seek.com.au on October 11, 2005. The National Association of Testing Authorities (NATA) was established in 1947 by the Commonwealth of Australia to provide accreditation of calibration and testing laboratories. In 1979, the National Pathology Accreditation Advisory Council (NPAAC) was formed, its aim being to formulate Standards for accreditation of pathology laboratories. The accreditation program for medical laboratories was established by NATA and the Royal College of Pathologists of Australasia (RCPA) in 1982, initially as a voluntary program. The program, at that stage, was designed to ensure a minimum acceptable standard of operation which over time would be raised. In 1986, accreditation of pathology laboratories became mandatory for the payment of Medicare benefits and NATA was appointed by the Commonwealth as the national accreditation agency responsible for conducting assessments. A major review of the accreditation process in pathology was undertaken in 2002. This resulted in the confirmation of the role of NATA/RCPA in providing accreditation and supported the concept of peer review as part of that process. From 1 January 2003, a new Deed between NATA and the Health Insurance Commission (HIC) has ensured a more stringent link between accreditation with NATA and the HIC. There are currently over 500 accredited pathology facilities both nationally and internationally, in countries such as Hong Kong and Malaysia. Laboratories continue to be assessed to the Standards set by NPAAC as well as ISO/IEC 17025 - 1999, General Requirements for the Competence of Testing and Calibration Laboratories and further specific requirements relating to pathology laboratories. "There are currently over 500 accredited pathology facilities ...". And not one of them is called "Australian Biologics". I wonder why not. Dr Buckley mentioned Friends of Science in Medicine. I signed on as a supporter and friend of the organisation on the day that it was born, although I leave the hard work of running it to others. They have just released a set of recommendations about the sort of pathology tests that should be seen as part of accepted medicine. A few years back I had a run-in with a "pathology" laboratory named Australian Biologics that threatened legal action against me for being less than complimentary about their activities. 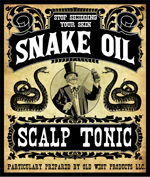 Sadly, almost ten years later it is still necessary to mention the same old scams like "live blood analysis" and "clot retraction" that have been extracting money out of the pockets of the unwary almost since the invention of the travelling medicine show. I totally endorse the recommendations, and I would like to see them implemented immediately. Or better still, retrospectively.